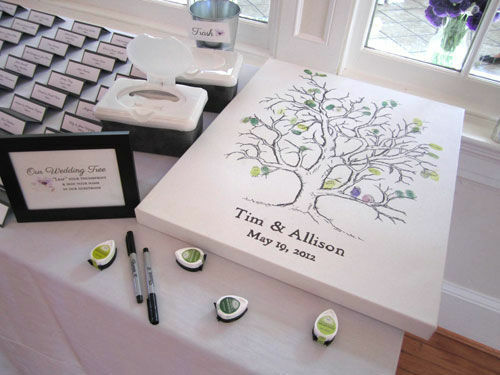 You may remember back in May of 2012, Allie and Tim were married in a beautiful Purple and Grey themed Virginia wedding. Today she’s back (a mere one year and 2 months later) showcasing some of the unique or handmade gifts she received at her big day! Take it away, Allie! While opening our wedding gifts we were delighted at all the thoughtful cards, messages and gifts we received from our family and friends. I have been friends with Mary for over 10 years now. Her crafty style is not with paper crafts as much as it uses a sewing machine. For a couple years her presents have been quilted bags and table runners. I was surprised on my wedding morning when Mary presented me with a large bag and required I open it immediately. Inside was an amazingly lovely quilt for Tim and I! She utilized our wedding colors and brought the first tears of the day. She is an amazing friend, and I can’t believe she made us a quilt! 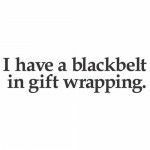 It is truly a wonderful and thoughtful gift that we frequently use! 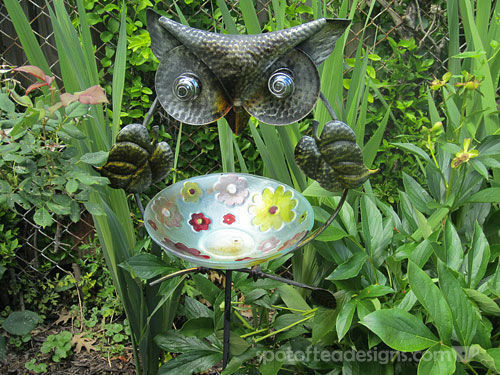 In addition to the beautiful quilt, in the true Owlison theme, Mary also included an awesome owl bird bath! I love gardening and my yard so I have a daily reminder of Mary when I go outside! Mary’s childhood friend Drew, and his wife Genevieve, moved from Texas to my area a few years ago. We quickly became great friends and Genny was a member of my bridal party. Soon after moving to the area they also made many personal and professional contacts. 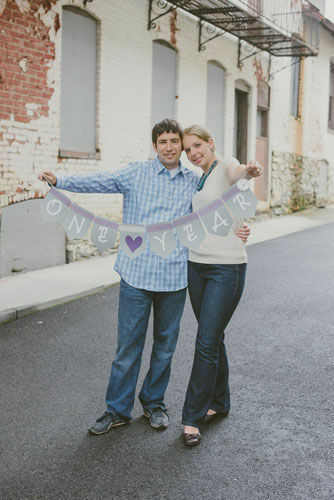 For their one-year anniversary they met with Lauren from Sweet Root Village and took some adorable anniversary photos of Genny and Drew. Sweet Root Village also set up a photo booth at Genny’s Arlington Art & Wine Bazaar and took one of my favorite photos of my husband and I – and this is despite my being in a big ugly sling from shoulder surgery. 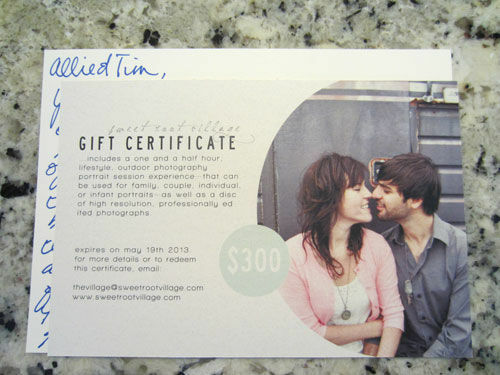 As you may have guessed by now, the wedding gift from Genny and Drew was a gift certificate for a photo session with Sweet Root Village! This was especially nice as my husband and I did not take professional engagement photos. Before I read the card that accompanied the gift certificate I knew I wanted to use the certificate for our one year anniversary — Genny made the same comment in the card! We really enjoyed our photo session and spending time together remembering our wedding a short year ago. My brother and his wife are world travelers and know how much Tim and I enjoy international cuisine. For our wedding gift they wanted to give us an excuse for a couple of date nights, as well as to taste some of their favorite types of food. 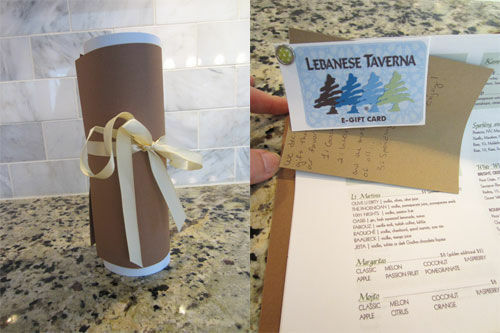 For one gift, my sister-in-law included the menu and a map to the restaurant rolled up with the E-Gift card attached. 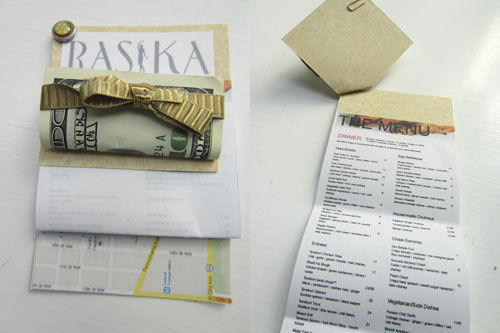 For the other, she included the same information, but rolled up cash towards our delicious meal. 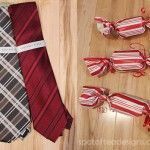 We know how hard it can sometimes be to find that extra unique gift so were impressed by a these gifts that stood out in the unique and meaningful category! 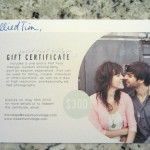 Loved reading this guest post! Had a blast photographing Allie and her husband!